As the Irish Optimist Trials fast approach Trials Coaching continued in the Club today with various Optimist groups travelling to train in our waters. Our Trials sailors went on the water with Diego Blatt and John Durcan, our non trials with Cian O’Regan and bronze sailors with Julie Tingle and Vikki Cudmore. Tomorrow sees the Copper Sailors take to the water to hone the new skills learnt in Baltimore. The river was awash with activity as the PY 500 race was underway when the Optimist sailors sailed down the river to find wind. This evening after the day’s coaching debriefs had taken place the Trialists were presented with their TEAM RCYC Trials Jackets. We had 11 Seniors and 14 Juniors qualify last year to compete in the IODAI Trials this April. A number of the senior sailors have moved on to other boats and we wish them continued success. 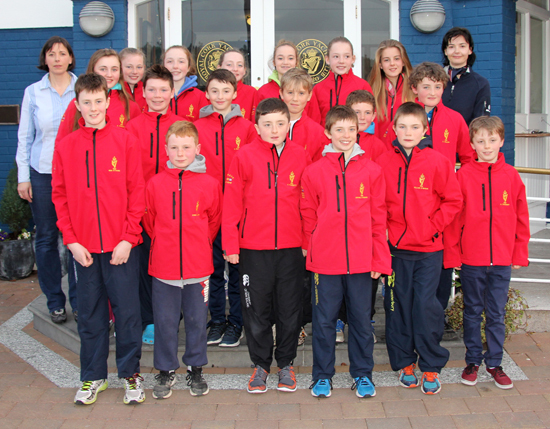 The sailors were presented with their jackets by Rear Admiral Dinghies – Celine McGrath. She spoke to the sailors about their achievement to date in qualifying for Trials and wished them every success in the event which is to be raced on 9th, 10th, 11th and 12th of April next in our Club. The ISA Youth Nationals are also taking place on the same dates – website here. The presentation of the Trials Jackets took place a little earlier this year. This is so our young sailors can proudly wear their “team gear” travelling to Poole for the UK Optimist Spring Championships on 28/29 March next. The planning to attend this event commenced on 5th November last with Linda O’Keeffe taking the lead in organising all elements of the trip. It promises to be a wonderful opportunity for the young sailors to travel and represent their Club and families as they are the only foreign sailors taking part in the event.